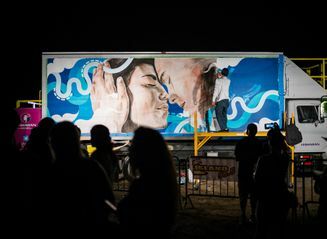 Hawaiian Airlines’ support of local and international artists took center stage on Feb. 6-13 when the airline welcomed Hawaiʻi and Japan’s top street artists, Kamea Hadar and husband and wife duo Hitotzuki, for a symbolic collaboration. 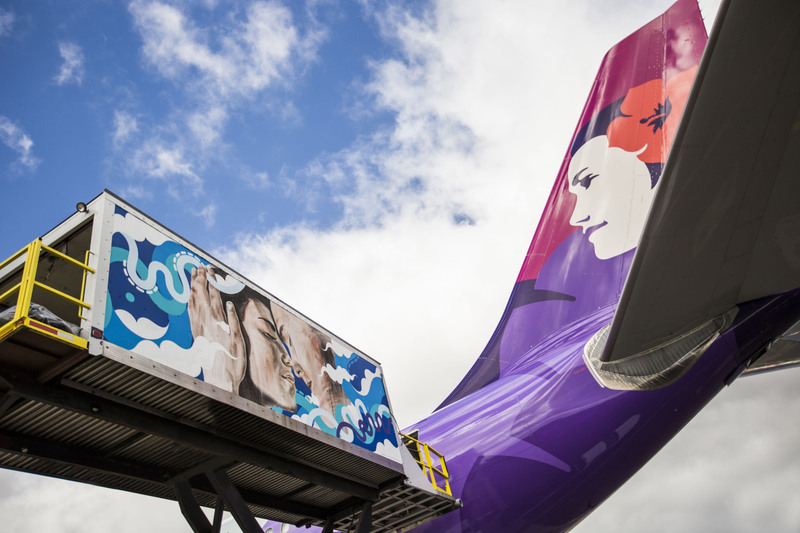 The artists adorned a Hawaiian Airlines ground service vehicle with their signature styles in a live painting to celebrate POW! WOW! 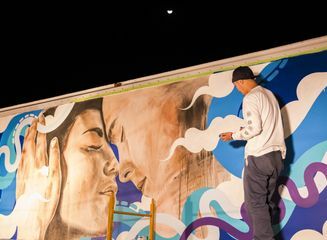 Hawaiʻi – an annual weeklong event in Honolulu consisting of gallery shows, lecture series, art and music schools, mural projects and concerts. 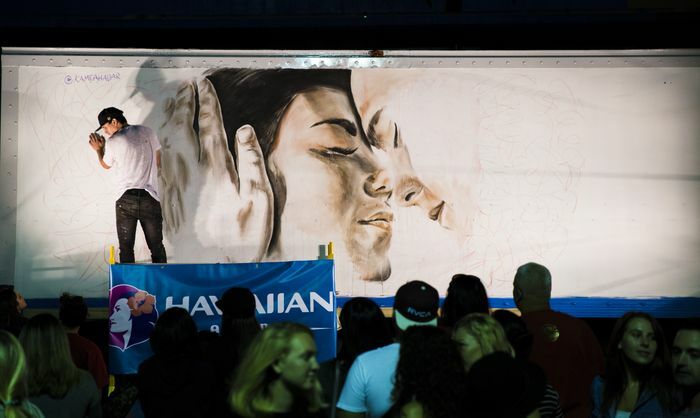 The service vehicle painting took place before hundreds of attendees during the event’s Feb. 6 kick-off festival at Honolulu Night Market and the Feb. 13 Trapped in Paradise finale concert. 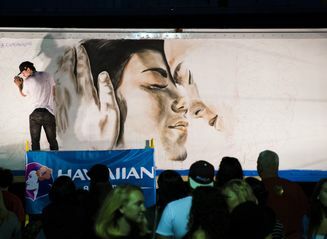 Concertgoers witnessed Hadar, known for his unorthodox portraiture style, paint a Hawaiian couple, their head and nose pressed together, sharing ha (breath of life). Hitotzuki (Kami and Sasu Yoshida from Tokyo), recognized for their flowing, symmetric motifs, complemented Kamea’s design with deep tones of blue and crisp white clouds reflective of Hawaiʻi’s picturesque scenery. The design concept was inspired by each culture’s strong sense of selfless service. Omotenashi is the Japanese term to ‘entertain guests wholeheartedly’ and Ho'okipa translates to ‘hospitality’ in Hawaiian. In both Japan and Hawaiʻi, welcoming guests with pride and honor, whether in one’s home or business, is a long-standing and respected tradition. 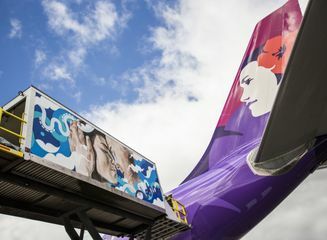 The newly designed Hawaiian Airlines service vehicle, which transports catering materials to aircraft, returned to normal operations at Honolulu International Airport, where passengers can get a glimpse of the exclusive artwork. This marks the third year Hawaiian Airlines has commissioned artists for service vehicle designs but the first year the public has been able to watch the live painting. 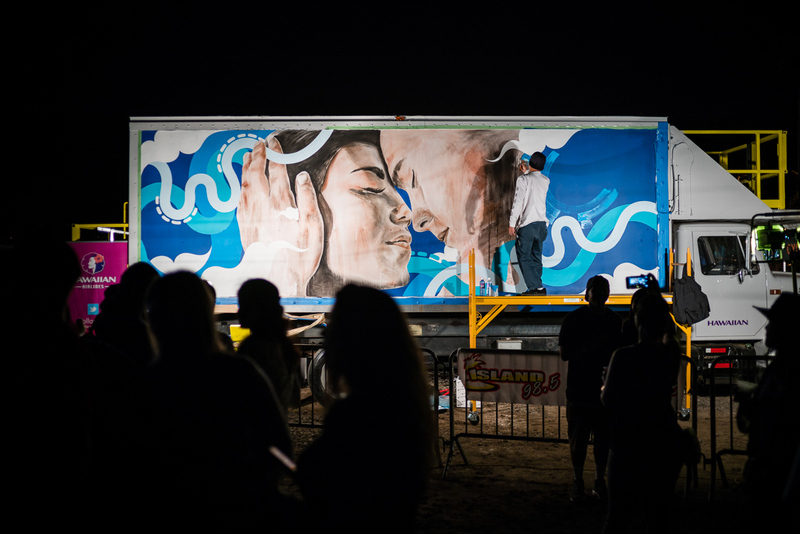 In 2015, Hawaiian commissioned acclaimed New Zealand artist duo BMD to paint images depicting the regions’ landscapes and native animals on a similar service vehicle in celebration of the airline’s second anniversary of service to Auckland. 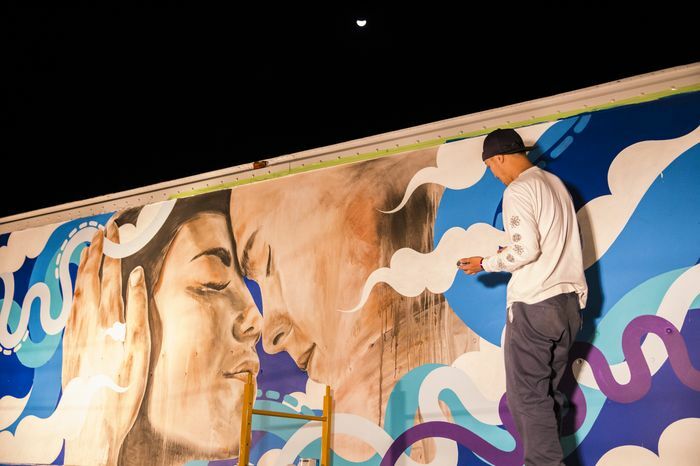 Previously, Hawaiian commissioned Hadar to paint a service vehicle in support of the launch of POW! WOW! Hawaiʻi. Hawaiʻi and Japan have long shared cultural ties that can be experienced through cuisine, customs, music and art. 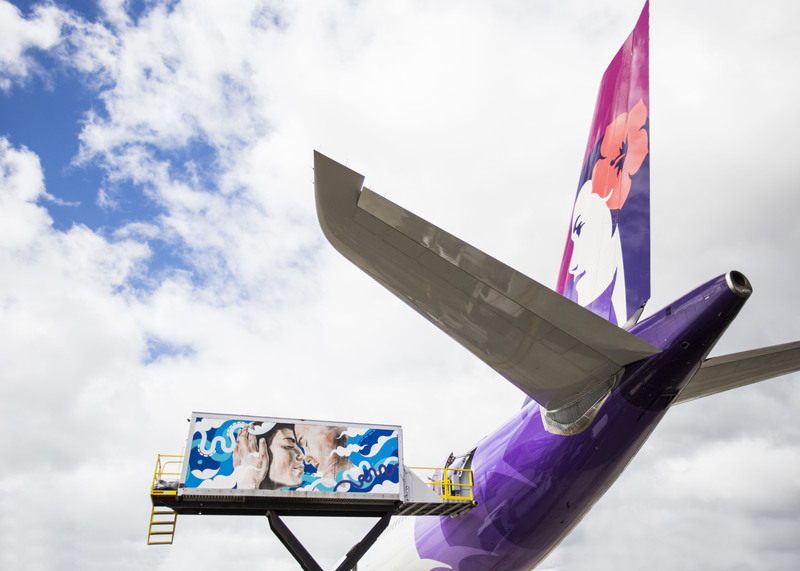 The dynamic partnership between the artists and the airline represents Hawaiʻi and Japan’s deepening connection. Hawaiian Airlines recently announced it will begin service to Narita International Airport starting July 22 and also rolled out a collection of enhanced in-flight services on its Japan routes, including meals prepared by Chef Lee Anne Wong of Koko Head Café. In October 2015, the airline supported the launch of POW! WOW! Japan in Tokyo’s Tennozu Isle. Hawaiian’s partnership with POW! WOW! extends beyond the annual festival. The airline’s corporate headquarters also is home to “Local Colors,” a rotating art gallery in which POW! WOW! directors Hadar and Jasper Wong curate and commission local artists to display their pieces.